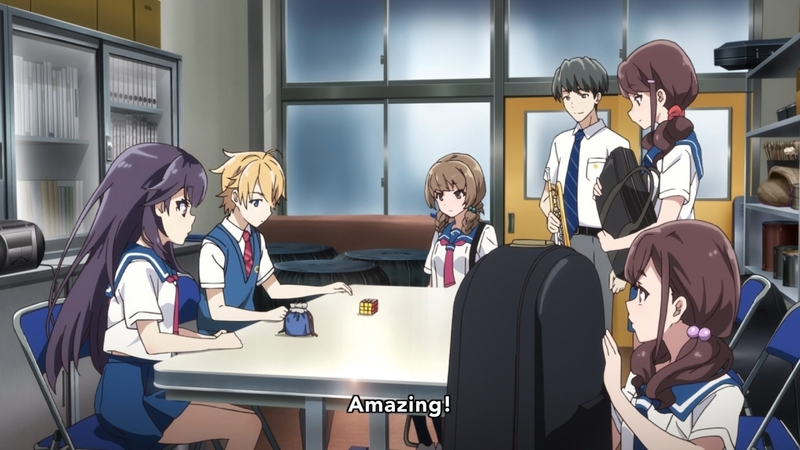 Just wanted to point out some animations mistakes from Haruchika that probably few people noticed. In Rubik’s Cubes, there is a concept of color schemes, which is the orientation of the color that appear on each side of the cube. There are two major color schemes in existence. The more common Western color scheme features white opposite of yellow, green opposite of blue, and red opposite of orange. It’s the one that we’re probably most used to seeing. The second color scheme is the Japanese color scheme, which instead features blue opposite of white and yellow opposite of green (keeping red opposite of orange). I rarely see this scheme, but I notice it easily because of how different it is from the Western colors. 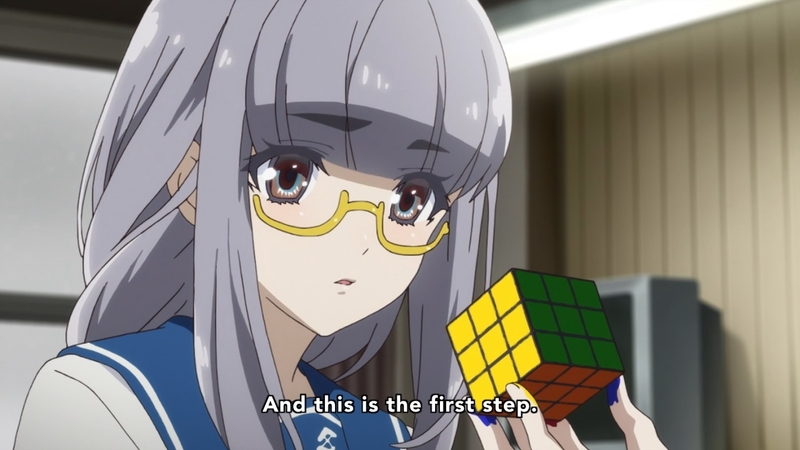 Now let’s look at the scene with Haruta solving the Rubik’s Cube. If you look closely at this screenshot, you will see a piece towards the left near Haruta’s left hand that has green and yellow on it. In the Japanese scheme, this is impossible because green and yellow are opposite of each other. 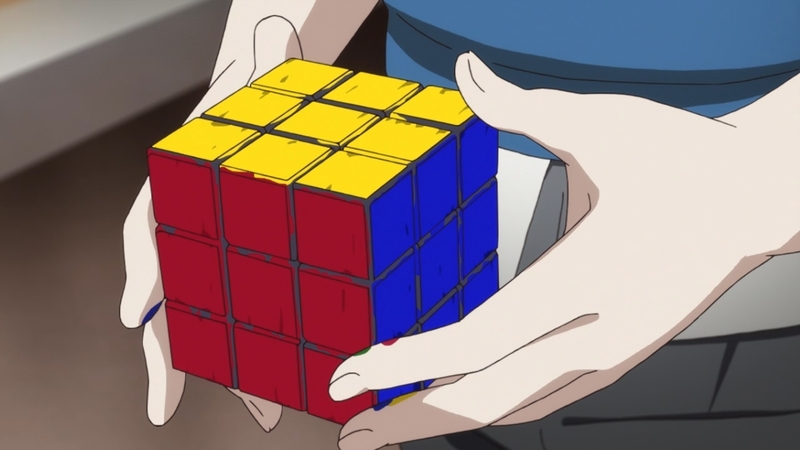 As a result, we can conclude that Haruta is solving a Rubik’s Cube with the Western coloring. Here’s another clue that this a Western cube. Notice the corner piece in the front that is blue, white, and orange. Since blue is opposite of white, this is also an impossible piece in the Japanese coloring. But here’s where things go wrong. 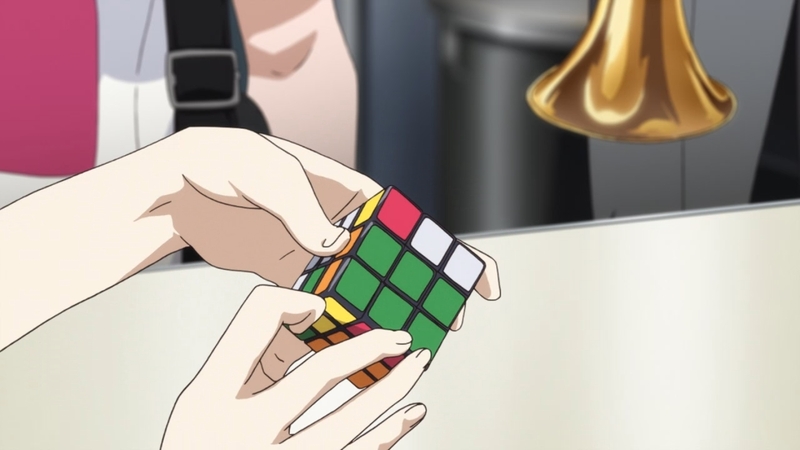 Look closely at the cube as Haruta puts it on the table (you may need to open the full-resolution image). Facing us is a yellow side, but the top is white. In the Western coloring, white and yellow are opposites, so they shouldn’t be showing up next to each other. This makes no sense! 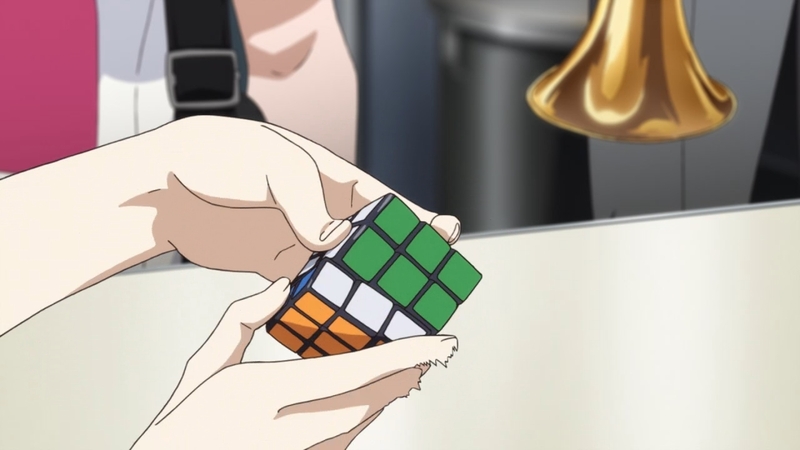 The same mistake is made at the very end of the episode too when Haruta paints the cube. Notice the orientation of the cube here. You can clearly see yellow on top with red in the front and blue on the right. If you look really closely here, you can see the tinge of green on the bottom (it’s too dark to be white). This is the Japanese color scheme, right? But here we have yellow and green magically next to each other…so, is this the Western color scheme? Again, these are things that probably only someone who has solved Rubik’s Cubes as much as I have would notice, but I hope you found it interesting. It’s easier to watch 1 episode a week than to let 3 pile up and watch them all in one sitting. Doesn’t matter how many cliffhangers there are. This just seems to be my preference. The number of post drafts that I’ve axed is roughly over 9000. I’m either too overly critical or just excessively lazy. Take your pick. No matter how much I write, I’m still 100% certain I’m trash. I’m really bad at advertising myself. Let’s help fix that a bit: find me on Twitter and Facebook linked on the sidebar. I’m trying to be a bit more active with social media. Also, the username “marthaurion” will find me in most places. Common stopping points: first episode, third episode, halfway through a show, four episodes before the end (don’t ask me why). 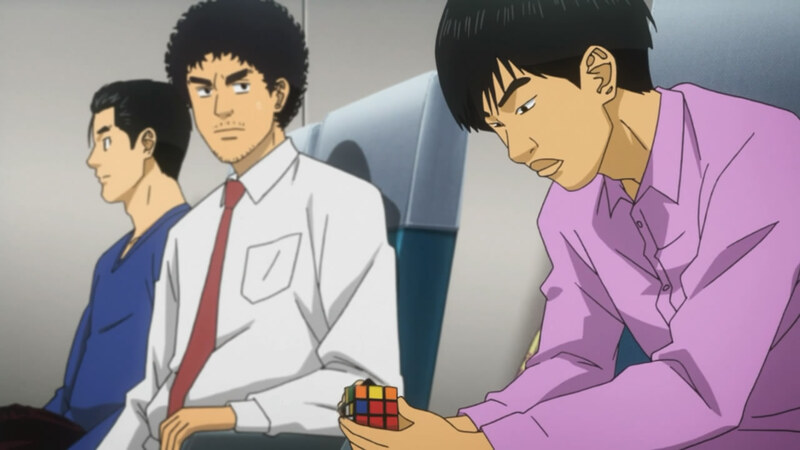 In other news, this weekend I will be participating in a local Rubik’s Cube competition. I’m severely out of practice, but we’ll see how it goes. The main goal for me is to qualify for all rounds and place at least in the top half of the competitors with my meager 16-17 second average. The third exam begins. As usual, our dimwitted protagonist fails to notice the cameras in the bus while Kenji does. I liked Kenji a lot in this episode…his behavior in the icebreaker and the look into his thoughts at the beginning. 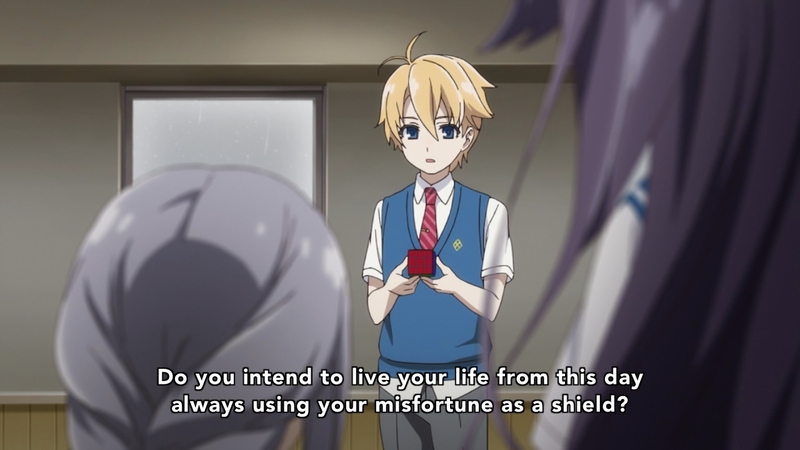 But man, that last part of the test with the questionnaire…I would hate to be put into that situation. There are so many ways you can read people’s rankings of each other that I’d have thought myself into a coma before writing down the first name. I’m really curious how they end up analyzing that. Not much to say about the preview…more exam stuff next week…not much I can really say about it. But with the episode content done, let’s go tangent a bit. I’m sorry, but I just can’t help myself. I need to analyze this guy’s technique. First off, his turning. He uses his full hand to turn, rather than just his fingers like I would. This makes each motion less efficient, despite how quickly he can turn. And then we have his method. If we look at the screenshot, he has the corner on the lowest level solved, but the edge on the middle level is not solved. This is an indicator of the basic method, known as layer-by-layer method. If it were me, I would have that edged solved simultaneously with the corner. If I had to guess, I would say his time is around 45 seconds, which is intermediate-ish level. Thought I’d do something a little different with this. Basically, just an average of 5 Rubik’s Cube solves. I haven’t really practiced in a while, so normally I’d be better than this. It’s a bit of an old video, but I’m still at that general speed. Another week has gone by. Was definitely swamped with volunteer work (sad as that may be). 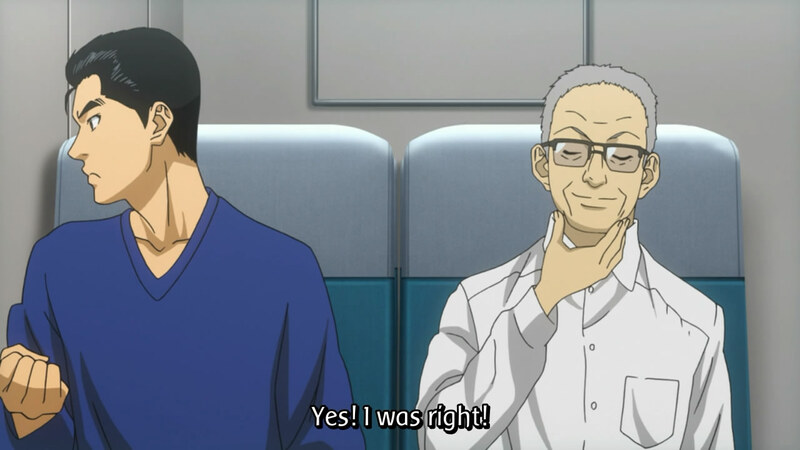 Anyways, Denpa Onna to Seishun Otoko and Hoshizora e Kakaru Hashi both finished. They were definitely entertaining. Also, I finished Hidan no Aria, which completed this week too. Also, I’m gonna try to get at least 2 reviews out this week. I think I’ll try to get into a pattern of reviewing something I watched a while back along with something that I’ve seen recently. This week, I’ll probably go for [C] and Angel Beats. Trying to keep things concise, so I’m going to put some Rubik’s Cube stuff here too. I started practicing again, and will probably be re-assembling some of my cubes. Also, I ordered a Dayan IV and a Dayan V, so those should be coming in any time. Also ordered some Lubix and I’ll probably test that out on one of my Guhongs. So yeah…I solve rubik’s cubes. I haven’t been very serious about it recently, so I’m not completely sure what my times are. So, for starters, I’m gonna make an estimation and try to keep a semi-regular update on my progress.